We were smitten with the Coyote 5.0-liter V8 the second we got behind the wheel of the 2011 Ford Mustang GT. We described the 412 horsepower engine as "a pot of pure honey" as well as "intoxicating," and said that the "5.0-liter V8 pulls like a jet airliner." With a curb weight of just over 3,600 pounds, the Mustang GT is not as bloated as the Camaro, but by no means a lightweight. Would we like the 5.0L even more if it had less mass to push around? That's what Superformance had in mind with its latest creation. 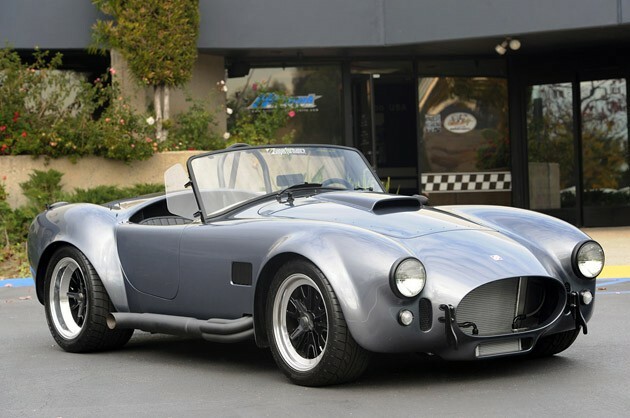 The maker of Shelby-licensed Cobra replicas has installed a Coyote 5.0-liter crate motor into one of its MKIII Roadsters, creating a combination of classic styling with the best of Ford's modern powertrains. The engine wedges snugly into the front of the car, and only a custom air intake and headers are all that are needed to make everything fit. We stopped by Superformance to get a closer look at the car, and came away with some photos and even some video of it in action. Check out the high-res gallery of the car below, and follow the jump to watch the video and hear what the Coyote 5.0-liter V8 sounds like without mufflers. Coyote Cobra: Superformance MKIII roadster powered by the Mustang's 5.0L V8 [w/video] originally appeared on Autoblog on Mon, 17 Jan 2011 19:59:00 EST. Please see our terms for use of feeds.